How have we worked together and what have we created? Welcome to the second day of Summer Challenge 2013 at Sheffield Hallam University! 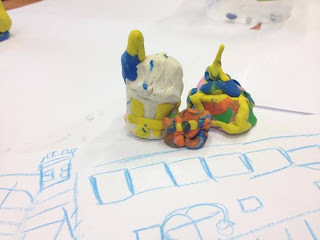 Use the blog comments box to explore your group work and tell us about what you have made! I really liked your film trailer idea Yakeen it was clear and would make an exciting trailer! It sounds like you wan to make a live action movie, you could think about how you will use your props and costumes and backgrounds to create your movie. Also remember that you can use other filmmaking styles like stop motion. You presented your pitch well and you had a clear idea of how to create a trailer well done! You made some good contributions to the discussion and you are working will in a team. You might want to think about how you are going to use stop motion animation and clay to create your film and use your storyboard to piece the most exciting bits of your story together. Hi Thea you worked well and made some good contributions to the discussion. I can see that you are really getting into the prop making - well done! You might want to think about getting some help during the live action bits when you make your film. You might want to also consider using stop motion and clay for some scenes in your film trailer. I'm glad you think that the summer challenge was epic! I think that you have learned a lot from this years sessions and you've been a keen artist and writer! You might want to think about how you are going to turn your film trailer ideas into a film and what techniques you are going to use. You might want to make sure that your storyboard shows the most exciting bits of your story. we were worked on the saem theme. We came up with our idea as a group and then we started writing. And then we started creating our trailer. My film is called Veggies Vs Ice. I created a story board and I need to start making my film which will be a stop motion animation. I can see from your written work and your storyboard that you are excited about producing your film trailer! You might want to check your storyboard to see if its showing the most exciting bits of your story. This will really help when you start creating your characters and backgrounds. I think that you have all worked hard. I hope that you can see the benefits of working together to solve a problem and how teamwork has made all your stories easier to write and turn into storyboards. and really think about how your voice over will describe your film!